July 1948 W.C.T.U. WILL MEET TUESDAY AFTERNOON The W.C.T.U. will meet Tuesday, July 20, in the home of Mrs. Ed Lincoln, Jr., at 1900 Fourth avenue. Members are asked to please note the change of meeting place *** TEMPERANCE COUNCIL HAS PICNIC IN PAKR The Youth Temperance Council enjoyed a picnic supper in Merrill Park Monday evening. Eighteen members and guests were present for the big supper. 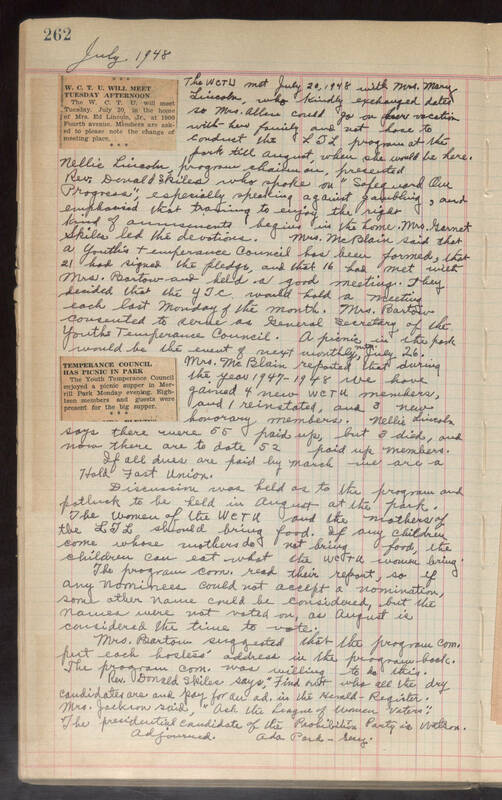 The WCTU met July 20, 1948 with Mrs. Mary Lincoln, who kindly exchanged dates so Mrs. Allen could go on her vacation with-her family and not have to conduct the LTL program at the park till August, when she would be here. Nellie Lincoln, program chairman, presented Rev. Donald Skiles who spoke on "Safeguard Our Progress", especially speaking against gambling, and emphasized that training(?) to enjoy the right kind of amusements begins in the home. Mrs. Garnet Skiles led the devotions. Mrs. McBlain said that a Youth's Temperance Council has been formed, that 21 had signed the pledge, and that 16 had met with Mrs. Bartow and held a good meeting.. They decided that the YTC would hold a meeting each last Monday of the Month. Mrs. Bartow consented to serve as General Secretary of the Youths Temperance Council. A picnic in the park would be the event of next monthly mtg., July 26. Mrs. McBlain reported that during the year 1947-1948 we have gained 4 new WCTU members, and 1 reinstated, and 3 new honorary members. Nellie Lincoln says there were 55 paid up, but 3 died, and now there are to date 52 paid up members. If all dues are paid by March we are a Hold Fast Union. Discussion was held as to the program and potluck to be held in August at the park. The Women of the WCTU and the mothers of the LTL should bring food. If any children come whose mothers do not bring food, the children can eat what the WCTU women bring. The program com. read the report, so if any nominees could not accept a nomination, some other name could be considered, but the names were not voted on, as August is considered the time to vote. Mrs. Bartow suggested that the program com. put each hostess' address in the program book. The program com. was willing to do this. Rev. Donald Skiles says, "Find out who all the dry candidates are and pay for an ad. in the Herald-Register. Mrs. Jackson said, "Ask the League of Women Voters". The presidential candidate of the Prohibition Party is Watson. Adjourned. Ada Park - Secy.